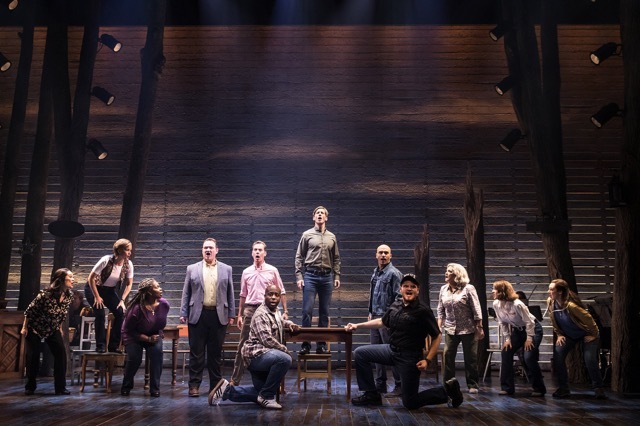 If you believe that people are basically decent in nature, COME FROM AWAY, the sensational Tony Award Winning musical, which opened at the Center Theatre Group/Ahmanson Theatre in Los Angeles, is solid proof. The story takes place in a little know place called Gander, Newfoundland. It’s in Canada and is the site of Gander International Airport, once an important refueling stop for transatlantic aircraft, and still a preferred emergency landing point for aircraft facing on-board medical or security issues. On the morning of September 11, 2001, the townsfolk of Gander learn of the terrorist attacks taking place in New York City, Washington, D.C., and Shanksville, Pennsylvania. The attacks result in US airspace being closed, forcing 38 international aircrafts to land unexpectedly at the Gander Airport. The population of the small Newfoundland town goes from 9000 to 16,000 over night. The Gander townspeople spring to action and prepare to house, feed, clothe and comfort the nearly 7,000 passengers (along with 19 animals in cargo). Once allowed off the planes and transferred to various emergency shelters in and around Gander, the passengers and crew learn the true reason why they were grounded. Frightened, they try desperately try to contact their families and pray for their loved ones, while the townsfolk work through the night to help them in any and every way possible. The travelers are initially taken aback by their hosts’ uncommon hospitality, but they slowly let their guards down and begin to bond with the quirky townspeople, as well as each other. Friendships and romances develop and the bonds that are made seem solid and long lasting. The book, music and lyrics of this simple but brilliant production are by Irene Sankoff and David Hein. The composers incorporate Newfoundland’s Irish, English and Cornish musical traditions into a driving, foot-tapping score that grows on you and manages to penetrate your soul. 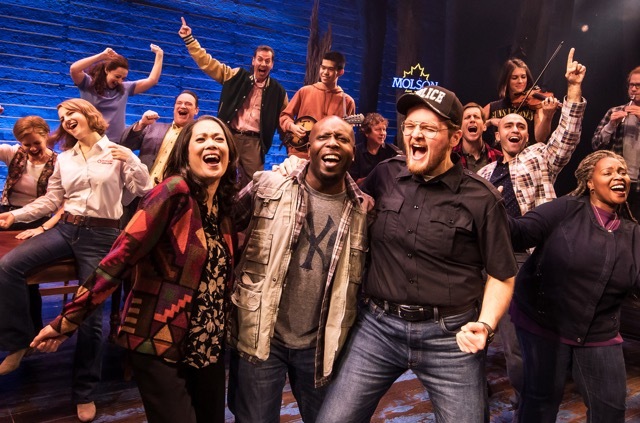 Stand out numbers include “Welcome to the Rock,” performed by the entire cast, Nick Duckart’s “Prayer,” and Danielle K. Thomas performing “I Am Here,” singing about the helplessness she feels as she wonders about the fate of her firefighter son in Manhattan. The cast also includes; Cast: Kevin Carolan, Harter Clingman, Chamblee Ferguson, Becky Gulsvig, Julie Johnson, Christine Toy Johnson, James Earl Jones II, Megan Mcginnis, Andrew Samonsky, Emily Walton, Marika Aubrey, Jane Bunting, Michael Brian Dunn, Julie Garnyé, Adam Halpin and Aaron Michael Ray. A simple but effective set design by Beowulf Boritt perfectly compliments this production. Less is more here, but what you feel is something you may always remember. 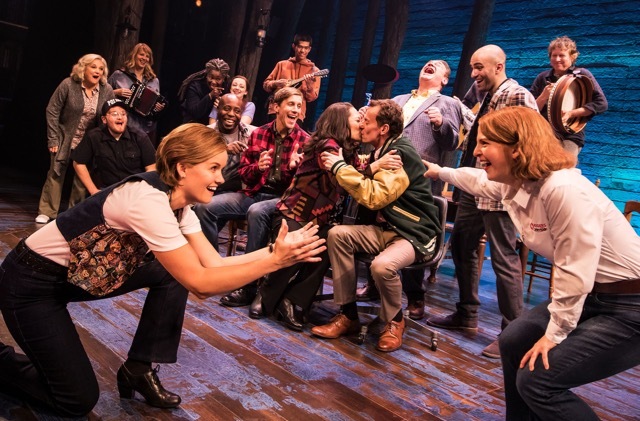 “Come From Away” is uplifting and energized. It’s a testament to the fact that people are inherently good and may imprint on you the need to trust and be kind to your neighbor. The show continues through January 6, 2019, at Center Theatre Group/Ahmanson Theatre. www.CenterTheatreGroup.org, or by visiting the Center Theatre Group Box Office located at the Ahmanson Theatre. Tickets range from $30 – $135 (ticket prices are subject tochange).